Jim Carrey was at AFI FEST (American Film Institute) on Monday the 13rd of November which was held in Los Angeles at Chinese Theatre and this event was presented by Audi. Actually this Festival is being held every fall. There was a special screening yesterday and there's gonna be another screening tomorrow, on the 15th of November. 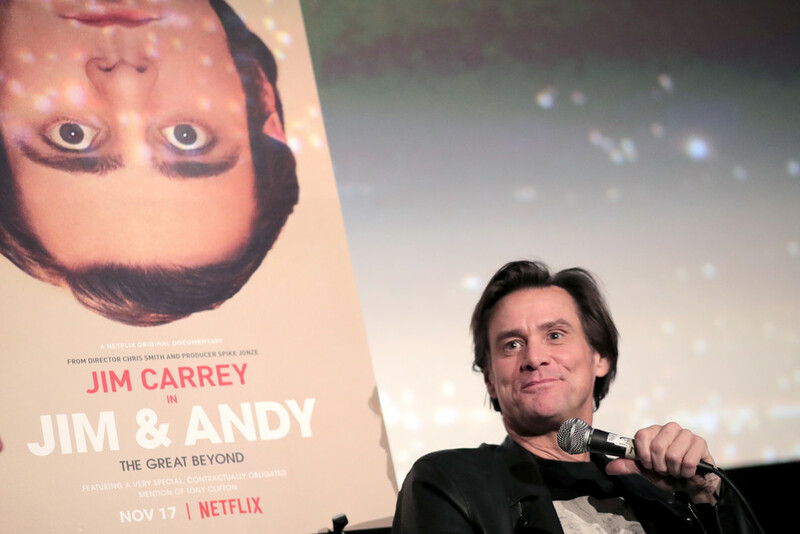 Jim Carrey was promoting his new documentary, "Jim & Andy - The Great Beyond", and also the director of the movie Chris Smith, producer Spike Jonze and Judd Apatow attended. With special guest Bob Zmuda! The crew was talking about the documentary on stage. You can check many photos in our Gallery. Jim Carrey looked great, he was wearing all black, including his favourite piece of clothing: the leather jacket. He seemed pretty happy and full of good vibes and was sharing lots of experiences, memories about the original movie "Man on the Moon". It was amazing to see him again and we can't wait to watch his new documentary! The official release of the film is going to be on the 17th of November, this Friday, at Netflix! We'll keep you updated, as always, as more news come. -- Source: AFI. With thanks to Terry Lynn Marvin. Click to comment this article.